Every conscientious pet owner should make themselves aware of the current thinking regarding the administering of vaccines. For some time now it has been felt by authorities in this field that we are giving our pets too many vaccines too often. Research is revealing that the immunization effectiveness of most vaccines lasts far longer than was ever believed. And some vaccines are either worthless, are given to protect from some disease that isn’t serious enough to even warrant a vaccine, or should be given only if certain lifestyle conditions exist. Unfortunately, there are vets who are unaware of the latest trends or are unwilling to give up those old time “annual” requirements. The vaccines on an AAGA Greyhound are up to date as of the adoption date. If they were NOT current when the dog arrived here in Atlanta, boosters are given at the time of his spay-neuter/heartworm test/health check visit by our vet. If the shots from the track ARE still current, we do NOT repeat them just for the convenience of the potential adopter! We elect instead to follow a “what’s best for the dog” policy and give no unnecessary vaccines. A 1-year DHPP shot one year following the last DHPP shot. If the vaccine is manufactured by Pfizer (as used by our vet), then this new inoculation may now be considered good for 3 years. 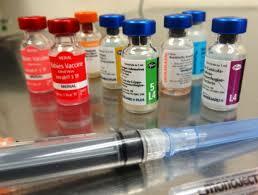 (For vaccines produced by other companies, you will have to confirm efficacy with your vet.) NOTE: If the most recent DHPP shot was given by our vet, we will indicate on the adoption records if it is to be considered as lasting 3 years. All other vaccines are considered “non core” and should be administered only if special conditions are present (e.g., certain areas of the country, particular dog occupations, exposure to special health hazards, etc). You will have to discuss with your vet which he/she recommends and then weigh the pros against the potential health risks. One of the newest ideas in immunology is titering. 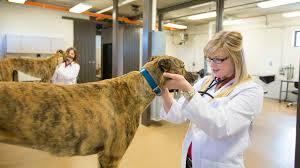 Before given any vaccine, the dog is tested to see if he still has immunity. If he does, no vaccine is given. Unfortunately, at this time, titering is still relatively expensive (maybe $50 to $200). So, dog owners elect to just give the shot rather than first pay for the test AND then for the shot anyway if it is determined to be needed. Hopefully, quick and inexpensive titering tests will be available in the not-too-distant future.